Rough - sorry dude, can not confirm it (yet). Probably yes, but I like to know for sure. Can anybody confirm this was coded by Nik? The rasters are just too much I think. 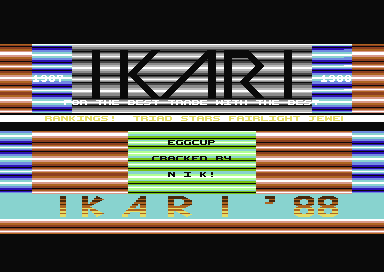 This is the classic Ikari intro. One of the first they used (AFAIK). The heavy raster usage really works well with the boppy music....certainly catches your attention.